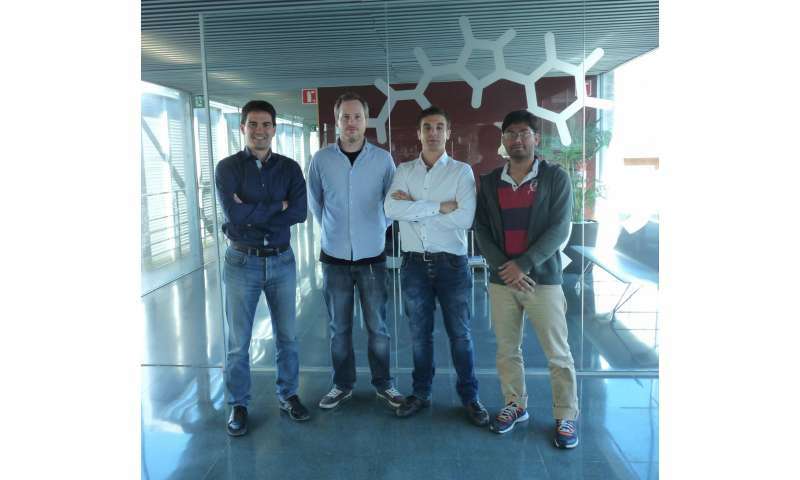 The research group of Prof. Paolo Melchiorre at ICIQ has developed a new methodology for the selective formation of chiral molecules. The work, that has been published in Nature, combines two strategies which require very mild reaction conditions—enantioselective iminium ion chemistry and photoredox catalysis—to set quaternary carbon stereocentres with high enantioselectivity. Chiral molecules are molecules in which a carbon atom is attached to four different substituents (which is called a quaternary stereocenter when all the four substituents are carbon-centred). If a molecule is chiral it exists in two enantiomeric forms (one is the mirror image of the other and they cannot superimpose). Chiral molecules have numerous applications, especially in the field of biochemistry as they were essential in the origin of life. As an example, the aminoacids that form the proteins in our body are chiral molecules but only one of the two possible enantiomers is present in the proteins. Many of the biological processes occurring in our body involve chiral molecules, which explains the fact that most of the drugs we use are chiral. Taking the example of chiral drugs, it may occur either that both enantiomers have a similar effect or that one has a therapeutic effect while the other is dangerous, as it happened with the famous case of thalidomide. Therefore, one of the main goals in the synthesis of drugs is the design and development of reactions for the selective synthesis of the desired enantiomer. In this context, the work developed by Prof. Melchiorre group represents a breakthrough in the synthesis of chiral molecules as it manages to perform the selective synthesis of the desired molecule via a new radical route that combines the action of a photocatalyst activated by visible light with a chiral organic catalyst. "Key to success was the design of a chiral organic catalyst which drives the stereoselective interception of photochemically-generated carbon-centred radicals. This catalyst may provide further opportunities to stereoselectively generate quaternary stereocenters that cannot be forged by using traditional polar reactivity. We are currently exploring these possibilities" -says professor Melchiorre. The synthesis of chiral molecules usually requires the presence of organometallic compounds and careful control of the reaction conditions. By contrast, the reaction developed at ICIQ can be performed under mild conditions, contributing to the sustainability of the process. Visible light photocatalysis and metal-free organocatalytic processes are powerful strategies of modern chemical research with extraordinary potential for the sustainable preparation of organic molecules. By developing an innovative methodology, the group of professor Melchiorre connects these two fields or research to provide a new framework for conceiving enantioselective organocatalytic processes in which the light has a key role as an energy source. "Combining the potential of metal-free enantioselective organocatalysis and visible light photocatalysis can significantly advance the development of a more responsible and sustainable stereoselective chemistry while strengthening the chemistry toolbox to better face the challenges of modern organic chemistry" -adds Prof. Melchiorre.